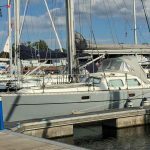 After buying our Oyster 435 sailing boat in Ipswich, absolutely nowhere near our home, we needed to get the boat back to Portsmouth so we could start preparing her for our sailing adventure. Getting her from Ipswich to Portsmouth involved crossing the terrifying Thames Estuary, riddled with sand banks, wind farms and massive ships, and sailing down the English Channel, the busiest shipping channel in the world ever, probably. This was going to be an adventure, especially as we barely know the blunt end from the pointy end. We’d better hire some help then. Let’s hope we get enough wind to sail and don’t sink, eh? Should it leak that much? Does it taste of wee? It’s eleven o’clock in the morning. We’re three hours out of Ipswich on our sailing boat, Grey Girl, crossing the Thames Estuary heading home to Portsmouth. The mist has come in, we can’t see the land, and I’m the aft cabin up to my ankles in water. We’re clearly sinking. It had been a long time coming but the day had finally arrived for us to leave the near permanent sunshine of Ipswich and sail Grey Girl home to Portsmouth. We’d been living on board for the best part of a week, getting lots of jobs done and generally having a very lovely time of it. Uncle Adam had arrived as extra crew for the journey. 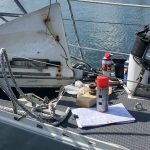 We’d re-rigged the reefing lines, sorted out the jack stays and provisioned enough food and water to sustain us for a month. 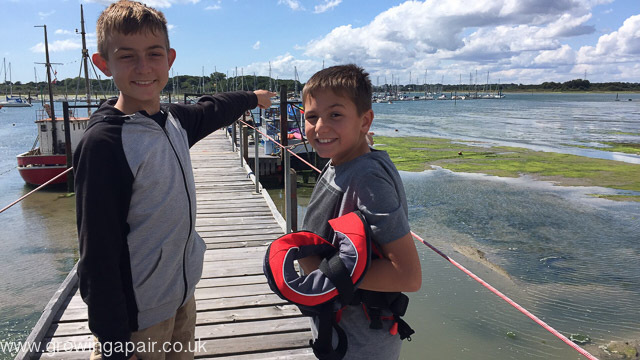 Click here to read about our first two months as boat owners in Ipswich. There had been a fair amount of angst around the subject of the skipper who was going to help get us through the treacherous waters of the Thames Estuary and the deadly sandbanks of Dungeness. Our original candidate had been confined to harbour by his doctor due to his rampant and uncontrollable blood pressure. His nominated replacement was somewhere between the Fastnet lighthouse and, well, just “somewhere” apparently. Still, a few glorious days later than planned, Paul The Skipper had arrived. At 8 o’clock sharp we skilfully negotiated the lock and headed down the River Orwell on our big adventure sailing from Ipswich to Portsmouth. Uncle Adam on the helm! With a flat calm and empty river ahead of us, I dutifully handed the helm over to Uncle Adam (that’s the last I saw of the helm for the next 28 hours – once it slipped into Adam’s grasp he was never going to let go) and went below to have a quick mop up and get the kettle on. I was more than a little disturbed by the amount of mopping that was required. The leaky prop shaft seal usually lets a few squirts of seawater in but not much more. I put the amount of mopping down to me not being overly zealous in following the rules on our last return to harbour. With the mopping done, and the tea brewed, I thought no more of the prop and returned to the cockpit. 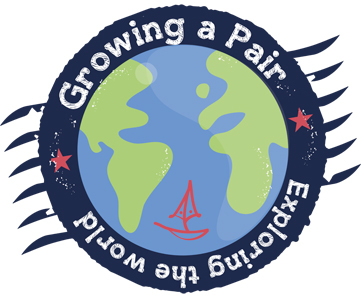 With Adam still at the helm, Paul kept us entertained with discussions of child-friendly destinations we could sail to in Europe – the lakes and canals of Belgium sound amazing – and the passing of sage advice on navigation, shipping channels and coll-regs. His experience of the water really showed as he was able to successfully predict the movements of other boats with unerring accuracy. 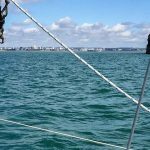 The land slowly slipped from view and we threaded our way through the sandbanks and wind farms that make the Thames Estuary so challenging. It was a properly lovely morning. 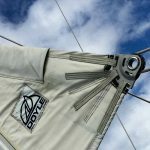 There was absolutely no wind, and our brief dalliance with the sails had done nothing other than slow us down a bit; so we’d put them away and continued to rely on the engine. The kids were chilling out, reading books and wind farm spotting. 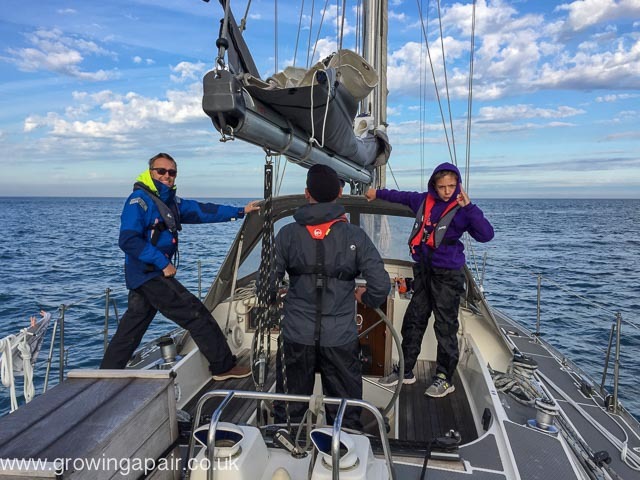 With Paul’s constant chatting and the lack of wind, it was spookily similar to the journey to from Tenerife to La Gomera on our RYA Day Skipper Course with Tony from Canary Sail. Only without the dolphins. Biscuit o’clock soon arrived but brought with it a very unpleasant surprise. I went below to put the kettle on to find the aft cabin under water! The sole boards were sloshing around and threatening to wash into the galley. Holy crap! We’re sinking! Panic ensued! 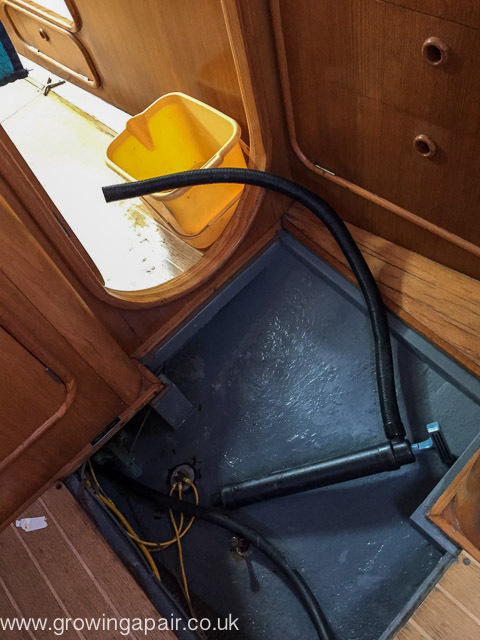 Sam was sent scurrying to the garage (lazarette) to fetch a pump and a bucket whilst Evan and I started bailing the water into the galley sink. With the aid of the pump, and some furious sink emptying from Evan’s little legs (There’s a foot pump to empty the sink), it took about ten minutes to bring the level of the water under control. Not wanting to even acknowledge the possibility of having to call the coastguard on our first proper sailing trip, I went looking for a benign explanation. The water wasn’t gushing in, thankfully, but where the hell had it come from? And was the ‘leak’ getting worse? My first thought was that we were sinking, obviously, but I put that to the back of my mind and tried something else. My second thought was that there was a problem with the heads, and we’d been pumping the bilges full of wee. There was no sign of a problem around the heads, or under the galley sink (not that we wee in the galley sink, but there is a lot of plumbing under there). 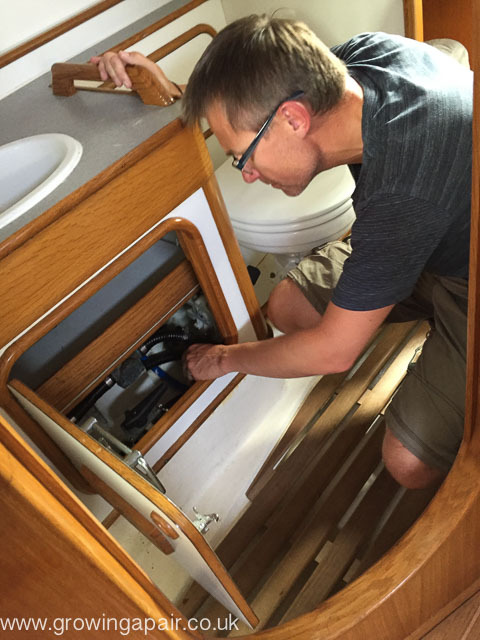 Mostly confident that Uncle Adam’s bladder wasn’t the source of the problem, I gingerly dipped a finger into the bilges, shut my eyes, and tasted the water. The sense of relief in finding that the water was fresh was amazing. It wasn’t salty, so we probably weren’t sinking. Phew! The water didn’t taste of Adam’s wee either, so I wouldn’t need antibiotics or counselling when we made it home. Double phew! The water was suspiciously warm though, which pointed our attention aft, towards the hot water tank. Sure enough, as soon as I opened the hatch to expose the hot water tank I was blasted with a huge cloud of steam. The pressure relief valve had stuck open somewhere around Harwich. 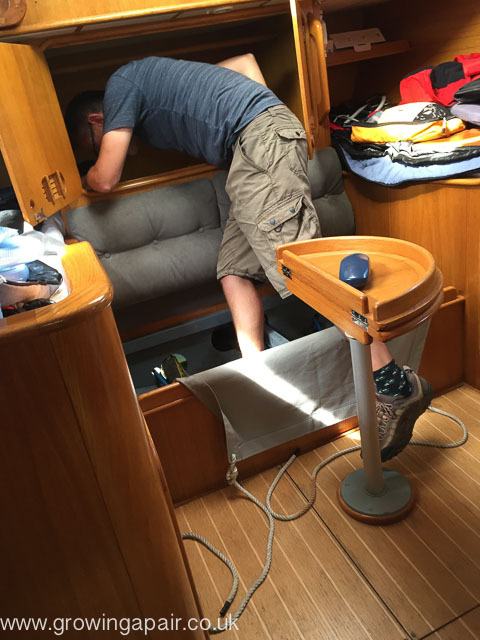 With the engine running for so long, we’d slowly been pumping all of our fresh water into the bilges. Nobody had heard the water pump over the sound of the engine and we’d quietly washed the bilges with 200 litres of fresh, hot water. Found it! The offending hot water tank. The problem was temporarily fixed by isolating the calorifier from the engine. With only a splash of water left in the tanks, leaving the water pump off for the rest of the journey wasn’t going to be too much of a problem. We’d stashed a good backup supply of fresh water in bottles, so there was no risk of dehydration. The kettle was put on, I changed my soiled pants and we finally got our hands on those biscuits. The original plan was to sail down the River Orwell, across the scary Thames Estuary, and then hide from the tide in Ramsgate or Dover whilst it was against us. We could then surf the tide to Eastbourne or maybe Brighton before having to lay up again before the final push to Portsmouth. But the latest wind forecast it was clear that we weren’t going to be troubling the sails for the next few days. The only way to get home was going to be using the engine. Even with the tide against us, we knew that the engine could keep us plodding on at 3 knots and so we ditched Plan A and decided make the passage in a single bounce. If we couldn’t sail, we were going to have an adventure chugging through the night. After a chilled day on the water, Floss and Adam took the first night watch. They had a very entertaining time star gazing and dodging errant fishing boats. 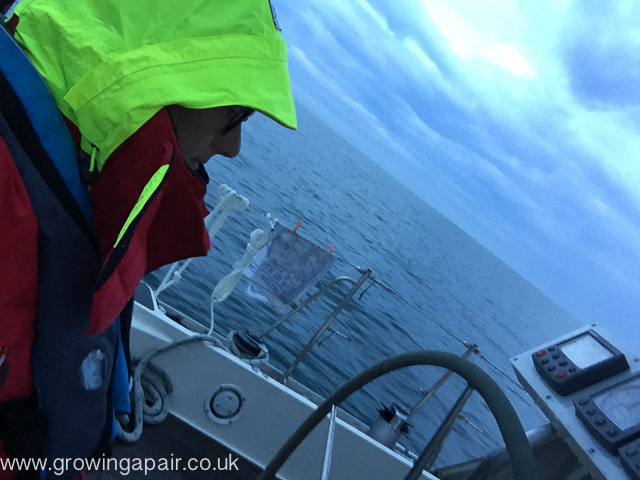 The sea was still flat calm with cracking visibility, but trying to decipher random collections of navigation lights whilst staying roughly on course is a real art form. Definitely more work needed on learning what the various combinations of lights mean. The sun going down. That tea towel is never gonna dry! First watch. Paul and I took over around 1am, just as we chugged past Eastbourne and the horizon started to darken with storm clouds. We had a spectacular hour watching the lightning roll across the channel towards us. And then a considerably less spectacular two hours hiding under the spray hood as we were battered by a biblical downpour. 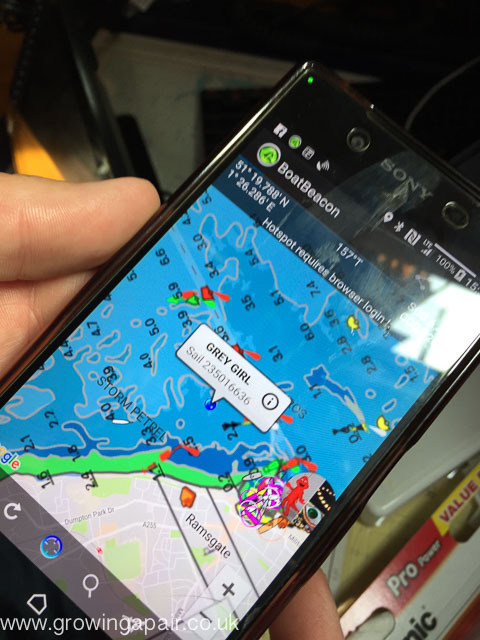 One thing that was particularly handy during this time was “Boat Beacon” – an app that turns your phone into a lightweight AIS transponder. Several times during the storm it alerted us to dangers heading our way way before we had any hope of seeing them. We’ll certainly be investing in a proper AIS system over the winter. Despite a significant lack of sleep (apart from the kids who had a cracking night’s kip) we were all pretty chipper as we cruised into the Solent and Portsmouth appeared through the mist. 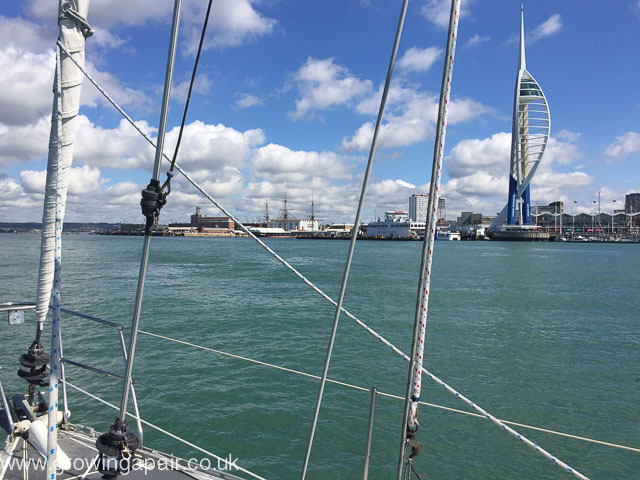 There was a slight westerly blow, and we briefly danced around the idea of putting the sails up and and cruising majestically into the harbour. The wind was right on our nose though so that silliness didn’t last long though, and the sails were left well alone. Ahhh!! HOME! Yay! Portsmouth’s Spinnaker Tower at the mouth of the harbour. 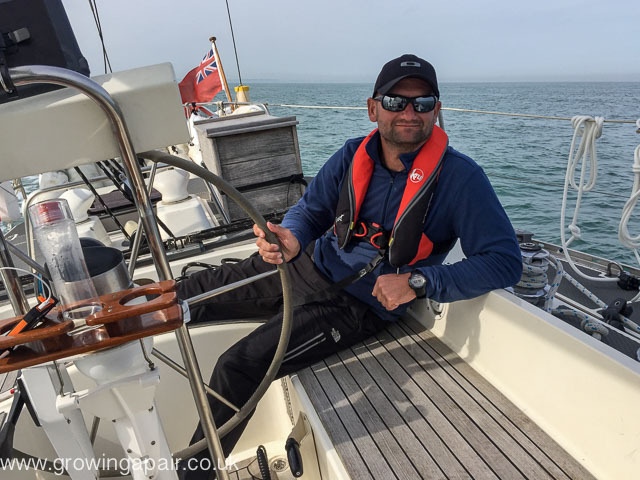 Uncle Adam finally relinquished control of the helm as we entered Portsmouth Harbour and headed up the channel to Wicor. There was a sudden flurry of activity as lines were set, fenders were deployed and we prepared for coming alongside at our new home. On the approach, our berth looked impossibly small, squeezed between two large and very expensive boats. But with no wind or tide to talk of I think that we did a pretty tidy job of it. Phew! Made it to our mooring at WicorMarine Yacht Haven. Book of Procedure, Rule 1….. True to their training, the kids did an outstanding job of getting everything ship shape and deploying Gappy the dinghy so that they could buzz us over to the shore where friends were waiting at the bar. We didn’t cry, but I was certainly close to it as the anxieties about the journey were washed away. In the weeks that had preceded the passage, we’d worried endlessly about all sorts of “what if” and “how would we” scenarios. The worry and the planning had all paid off though, as the passage was way smoother than either of us could have hoped for. The weather was lovely, the kids were amazing and despite a minor hiccough with the hot water tank, the boat was flawless. Quite disappointed that we didn’t get any wind but we made it home so who cares? There will be plenty of opportunity for wind in the future, I’m sure. 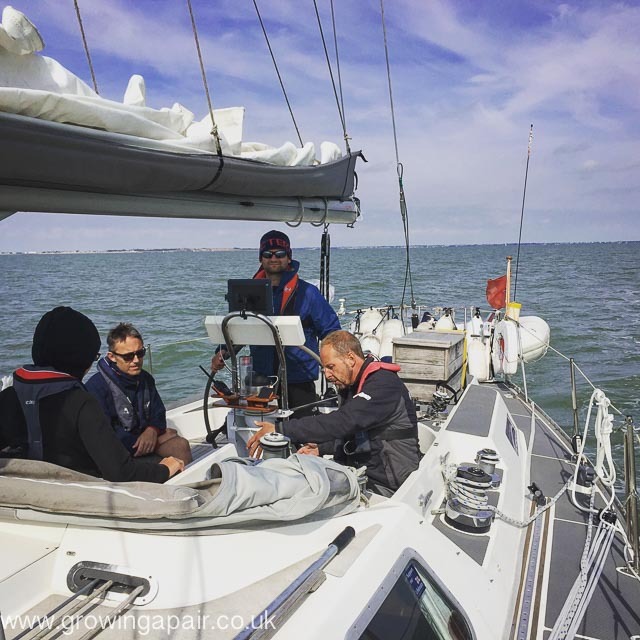 Having Paul on board was a great help and a massive confidence boost. I think we could have got ourselves safely home on our own, but we wouldn’t have enjoyed it nearly as much. And we did enjoy it. I think we’ll look back on it as one of our most formative sailing experiences, even though we didn’t actually do any sailing. Love sailing. Love being together. Got to get that valve fixed. Ipswich to Portsmouth in 29 hours. DONE! it was an amazing trip to be fair dez, enjoyed every minute of it mate. It certainly was Uncle Adam. A proper adventure, and it was great to be able to share it with you. Thank you so much for rearranging your work schedule to make it happen. We couldn’t have done it without you! I just came across your blog and I’m thoroughly enjoying reading it. 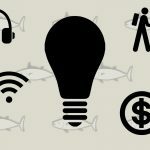 My husband and I are planning on buying a liveaboard within the next two months. How did you end up finding Paul the skipper? 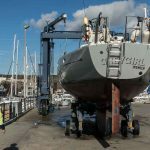 We are looking at boats in northern part of England as well as Ipswich but ideally would like to have a professional who can help us to deliver it to south of England.